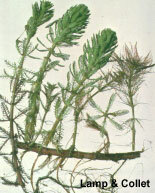 Growth Habit: A feathery aquatic plant with stems that can grow up to 2m in length. The tips of the stems frequently protrude from the water up to 30cm. The short leaves grow in tight whorls and are shades of bright yellow and green. Type of Plant: Parrots feather is a perennial. Flowers: Flowering rarely occurs in Tasmania due to cooler water temperatures. Fruit/Seed: Seeds are infertile in Australia due to only female plants being recorded here. Dispersal: Parrots feather reproduces by fragments breaking from the parent plant and being moved by water currents. They may grow free:floating for a period before rooting in sediment. Distribution: Found in shallow water bodies, pools and creeks. Also commonly found in home aquaria as the plant was once sold as an attractive fish tank plant. Like many aquatic weeds, Parrots feather grows especially well in water with high nutrient levels. Status: Declared a Secondary and Prohibited plant in Tasmania. Parrots feather is capable of totally choking water ways, excluding all other flora and fauna. Manual (spring, summer and autumn). Remove all stems and roots. Disposal (all year). Dry out all material on the ground in the sun. Never dispose of any Parrot’s feather in ditches, creeks etc. Herbicide (summer). As this plant is located in waterways, herbicidal treatment needs care. Contact DPIWE for further information.